Last week’s election victory by Alexandra Ocasio-Cortez has been widely reported as a stunning upset in part due to her aggressive use of social media. Did she win just because of social media? No. Did social media take her from self-professed goals of impacting the dialogue with a 30-40 point showing to a 57% win? Yes, a BIG YES. But what does that actually mean? All politicians use social media; but only some win with it. How did she use it and why did it work? Let’s look at her campaign through the brand marketing lens our company, LiveWorld, uses to analyze and create successful social media programs for the largest brands in the world. 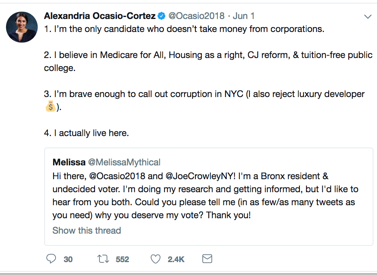 Ocasio-Cortez is indeed new to being a candidate; but by no means is she a neophyte to social media. She is a digital native of a generation raised on social media, and a master of its language, forms, and emotional energy. Her social program, pushing her over the top, is a near-perfect execution of the social marketing playbook we recommend to brands—but few have the understanding, focus, and will power to do. Social was the essence of the Ocasio-Cortez campaign—baked into its core. Her campaign really lived along with her, walking in the streets and through neighborhoods where she and her voters (and their emotions, aspirations, and disappointments) live every day. 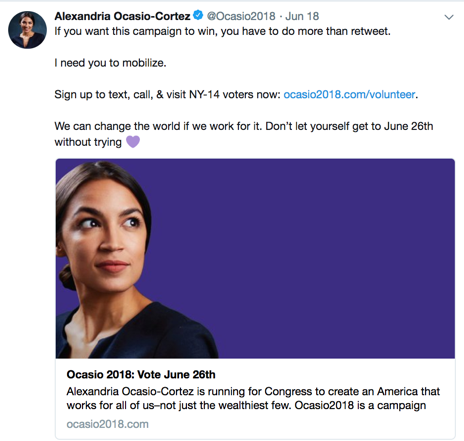 Fully integrated with everything else Ocasio-Cortez was doing, the campaign used social media channels distinctly in the way each works best. The team wasn’t just cross-posting content; they created organic content designed for each specific channel. It was clear that Alexandria wanted to connect with people, not just broadcast to them. Her team built apps (for a local election!) that helped connect volunteers to work, share content, donate money, and mobilize for events. The Ocasio-Cortez campaign reflects the political paradigm shift happening today. In previous times, candidates would plan their campaign strategy around the predominant media of the day—holding events to take advantage of publishing cycles for newspapers or TV. Social media is today’s predominant media, so campaigns need to adjust their thinking to account for the unique characteristics of social compared to broadcast. 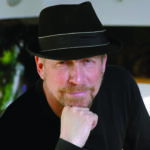 For Crowley, like most politicians and corporate brands, social seemed just another add-on channel through which to communicate pre-canned, sterile, low-risk messages; control the narrative; mitigate risk; and redirect interactions out of public view. 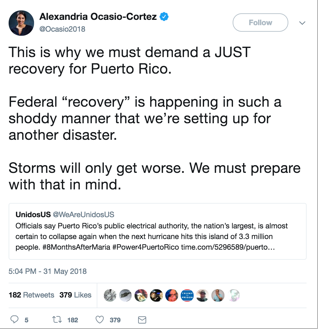 Ocasio-Cortez speaks in the language of social media—authentic, emotional, sprinkled with emojis, and in short sentences with great meaning. Ocasio-Cortez is transparent, authentic, driven by passion/emotion, and a digital native who intuitively knows how to use these platforms to communicate. And she comes across as a very earnest, passionate person, not as a politician or a brand. She speaks in the language and form of social media with short, direct points, sprinkled with emojis and toned with emotion. This compares to Crowley, who comes across very much as establishment, with a neutral, bland voice, befitting the decorum of a Congressman. The voters can feel Alexandria; at most, they can intellectualize Crowley. People buy things based on emotion, and then use information to justify their purchases. They vote that way too. To begin with, Alexandria herself is clearly is doing most, if not all, of her social media posting. Many politicians and business executives alike have staff do their posting with generic content and generic effect. Nuances of one’s own life don’t come through that way; people can sense it. And it makes huge difference in programs like an election, where it’s critical that voters identify with the candidate. Ocasio-Cortez speaks to who she is as a real human being, just like you. Her viral video, The Courage To Change, which she herself wrote and narrates, begins with “A woman like me isn’t supposed to run for office,” communicating that she comes from the people the establishment no longer represents. Her message is that it’s time for the people to stand up for themselves, which means one of us, which means her. Images throughout the video show that she’s an everyday person. She takes the subway, passing by the houses of everyday people. My favorite is one that every woman I know in New York City will recognize: While waiting on the subway platform to take the train to work, she changes her shoes. She takes issues head-on in social media—embracing, challenging, diffusing—but always addressing. Her approach is what we call “3 Is,” meaning Inspire, Involve, Imagine—versus a traditional brand or political approach of “3 Cs,” meaning Command, Control, Contain. As the incumbent, Crowley rarely mentioned Ocasio-Cortez, and didn’t give much focus to her in this race. She attempted to engage him several times on Twitter and replied to some of his tweets, but we didn’t see any cases where he replied to her posts. Perhaps most emblematic of their different approaches is this exchange each candidate had with voter @MelissaMythical, who posted a question on Twitter. Both respond the same day, both try to be personal with the voter and show they care, but what they say, and the impression they leave, is quite different. Melissa @MelissaMythical Hi there, @Ocasio2018 and @JoeCrowleyNY! I’m a Bronx resident & undecided voter. I’m doing my research and getting informed, but I’d like to hear from both you both. Could you please tell me (in as few/as many tweets as you need) why you deserve my vote? Thank you! Congressman Crowley responds, deflecting the subject off-channel (a customer service worst practice in business)—perfectly nice, but nonetheless typical political speak. @ JoeCrowleyNY Hi Melissa -would love to talk about the Bronx and issues you care about most. Can you DM a # so we can connect? Ocasio-Cortez engages and directly answers Melissa’s question in front of the world. I’m the only candidate who doesn’t take money from corporations. I believe in Medicare for All, Housing as a right, CJ reform, & tuition-free public college. I’m brave enough to call out corruption in NYC (I also reject luxury developer $). Our analysis found that Ocasio-Cortez again and again used words like “we”, “our,” “together,” “your,” and “us” with her hashtag-turned-meme, “#oneofus.” Her entire feel is that she’s talking with you. Most corporate marketers want to talk about themselves and their products. After all, they want their customers to know all about them and the products so they’ll be convinced to buy. This has been their game plan for decades of the TV mass marketing age. It’s the same for politicians. But it’s exactly the wrong approach in social media, where the content should be a mix of the product (the candidate), the subject matter (the issues), and the customer (the voters). Whereas most brands and candidates dominate social media with the product story, the best results come from dominating it with the customer story. And she didn’t wait for the stories to come to her. 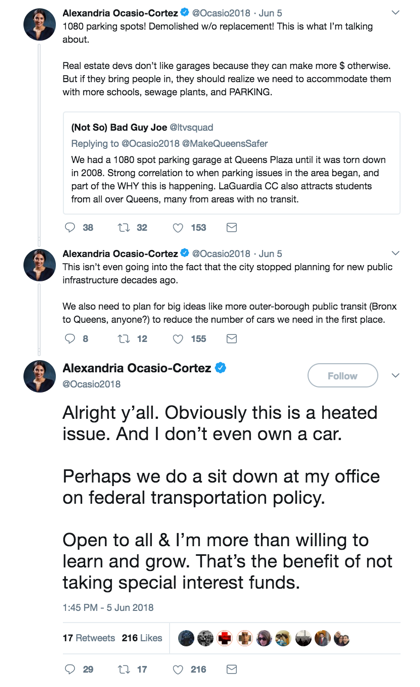 As a digital native, Ocasio-Cortez was very good at being concise in her initial posts, and using them to spur more in-depth conversation. She gave her followers lots of content assets to share, while praising the power of grassroots activism—and sure enough, she got a lot of her content shared. That’s really big for a campaign that doesn’t have a huge amount of money to spend on a media buy. Ocasio-Cortez speaks four languages and all her materials went out in different languages, customized to the social and cultural norms of the language. Nothing says “we’re about you, not me” like making sure the cultural context is that of your customers/voters. While this social media axiom seems obvious to digital natives, most brands and politicians ignore it. 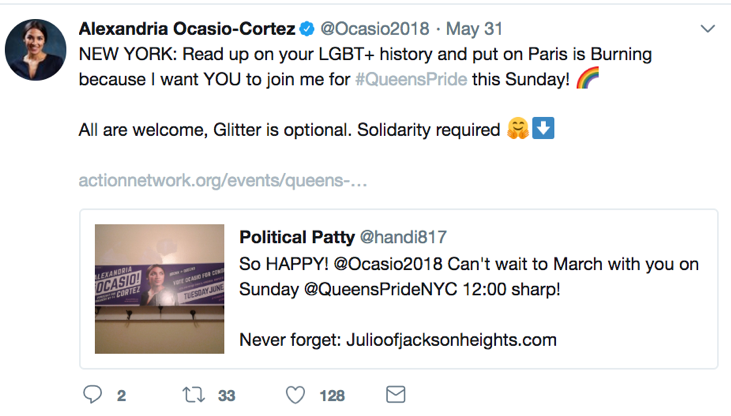 Politicians tend to define “participation” as “donation.” Ocasio-Cortez not only persistently asked for engagement and feedback in her posts, but she also asked people to share content, she shared a LOT of content from others, and she had easy ways for people to participate. They could join the phone bank (whether they lived in the district or not), show up for town halls and protests, and share their experiences at events. And they did. 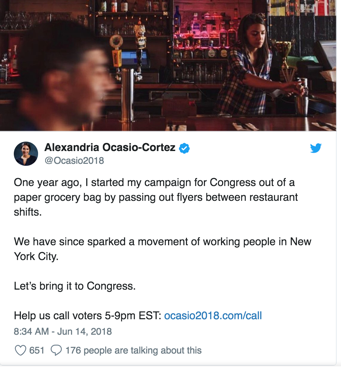 Ocasio-Cortez brilliantly used social to mobilize people to action. Her web/mobile-based app allowed *anyone* to work a phone bank from their own device, so that when people on Twitter would say something like, “Love and support Ocasio-Cortez and wish I could vote for her but I live in ATL,” Ocasio-Cortez replied immediately with a link explaining how to help the cause. She mobilized people in real time to show up at protests and town halls. She tapped four energy sources: the rise of women in the face of being treated second-class, progressive issues, populist anti-establishment feeling (especially for democrats who feel their party’s leadership is out of touch), and in her district, anti-Trump sentiment. She pulled in many infrequent voters, inspiring first-time activists, and thus changing the vote mix in her favor—Bernie 2.0! Indeed she was an organizer in the Bernie Sanders campaign. 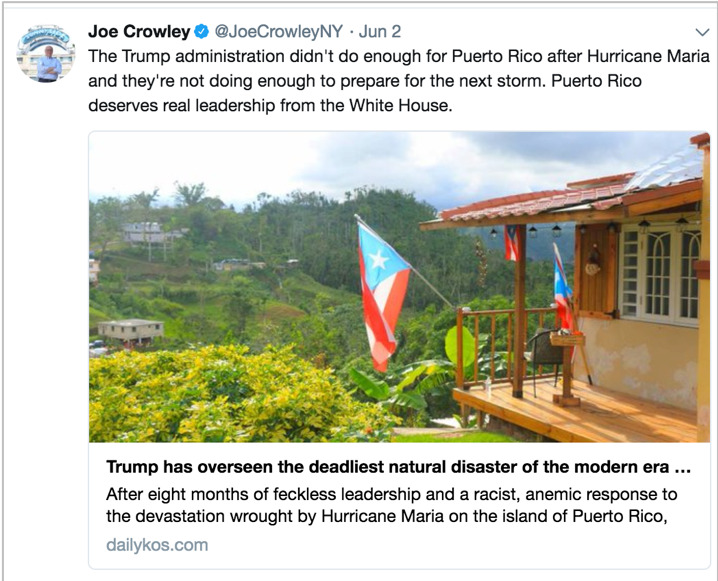 Long-time democratic incumbent, senior member, even heir-apparent of the Democratic caucus, and boss of the Queens democratic machine, Crowley had a social presence typical of any disconnected corporate or political brand—not much activity and not authentic. He tried, but it was always, “look at me and my leadership, the things I’ve done for the district, what I think about issues, and how I take stands against Trump.” This is okay content, but classically political, and not about the emotions and lives of the voters. Ocasio-Cortez used social to effectively amplify herself, such that she was not simply a candidate, and certainly not one of those disconnected politicians. She became a movement of “us” against “those who don’t really care about us,” and against those who “don’t live here, don’t drink our water, or breathe our air.” By hitting fundamental life needs, she connected all her positions to them and set up her opponent as someone who simply didn’t understand, did not care about, and certainly couldn’t represent us. The more Crowley acted, spoke, or stayed back, the more it reinforced her message and the emotional reasons people should vote for her. She mobilized people to action, inspiring donations from across the country and get-out-the-vote supporters walking across her district. Like any marketing program, an effective political campaign has to achieve specific goals. For a new candidate, it’s much like a startup business: raise money and get people to buy the product (which means vote). Social went viral, enabling Ocasio-Cortez to raise $400,000 with no corporate contributions, amplified by an even larger amount of free news coverage. She won 57% of the vote, far beyond what her team ever imagined. The lesson here for all candidates is that effective social media can level the playing field for money and votes by changing the rules to authentic, transparent, conversational, and emotional—“we,” not “me.” And there’s an advisory too. Watch out D.C. Alexandria Ocasio-Cortez is coming to town and she’s not alone. She’s a digital native using the full power of social media to bring her people and their cause with her. She is bringing we.